Spine and neurosurgery have always been tedious and complex. AMRI hospitals have introduced the latest technology, the O-arm navigation system for a more advanced and safer surgery procedure. The O-arm provides the 3D surgical imaging equipment and navigation system for accurate and precision based spine and neurosurgery. The O-arm surgical imaging system has successfully established itself as the first multi-dimensional intra-operative imaging device in spine surgery. It delivers flawless image quality and quick 3D reconstruction. Along with O-arm, S8 Navigator is also useful for brain (soft tumour) surgeries. O-arm S8 navigation system is customised for the benefit of both patients and surgeons. This system will enable patients to undergo minimal incision surgery and incur minimal or no blood loss. This will reduce their stay at hospital. The post operative care is minimal with reduced pain and quicker recovery time. The O-arm technology will also reduce risk of tissue damage which is likely to prevent the risk of post-operative infection. O-arm S8 Navigation System will also aid surgeons by providing a detailed view of patient’s anatomy in real time and enable accurate navigation through the delicate anatomy and critical structures in the spine. The O-arm reduces radiation in the surgery. The team that will be working on this technology will be led by the nationally acclaimed neurosurgeon with over 20 years of experience, Dr. Sisir Das, Director and Head of the Department of Neurosurgery at AMRI Hospital Mukundapur. 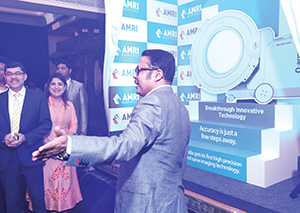 At present, AMRI is the only hospital in Kolkata to have introduced high tech medical technology in eastern India. The hospital has already conducted about 15-20 surgeries with the equipment so far. Patients will have to incur an additional cost of around `20,000 more for the surgery.